The Valiantes have a vision to see a thriving, biblically-sound seminary established at Haven of Grace on the island of Negros in the Philippines. Their desire is to equip and train national pastors to spread the message of the Gospel, not just in the Philippines, but all throughout Southeast Asia. In order to make a seminary-level education attainable for as many Filipinos as possible, the Valiantes are not taking a salary from Haven of Grace Seminary. Therefore they will need to raise support for their needs (Food / Travel and Vehicle Expenses / Insurance / Health Care / Children’s Education / Electric etc.). Thankfully, while serving at the seminary their housing will be provided which means they will only need to raise a modest sum. 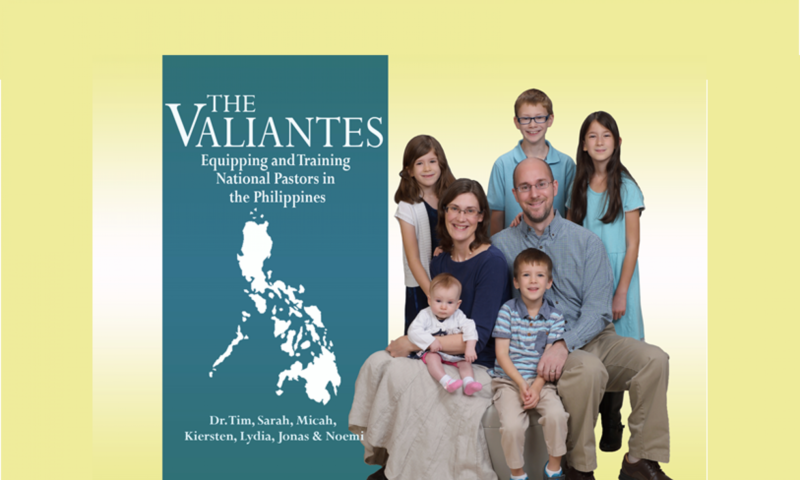 However, the Valiante’s are entirely dependent upon the support of churches and individuals who want to partner with them to see a thriving seminary training men to take the Gospel to the Philippines and beyond. Click this link (Easy Tithe) to visit the PRMI giving webpage. You can give a one-time gift or register to set up monthly or recurring giving. When giving specifically to the Valiantes, click on the drop down menu that says, “General Fund” and select “Missionary Support Fund – Valiantes.” All giving is tax-deductible and those giving will receive a statement of giving each January. You can also access this giving page through the Pacific Rim Missions International website (https://www.pacificrimmissions.org/) by clicking on the “Donate” button at the top right of the page.